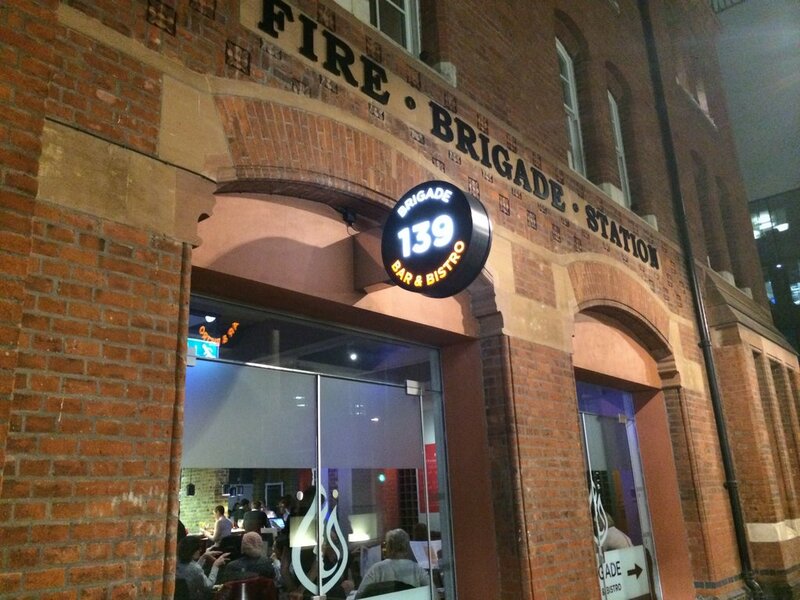 Restaurants seem to be opening in converted fire stations at an alarming rate at the moment (where are all the fire engines going to go!). 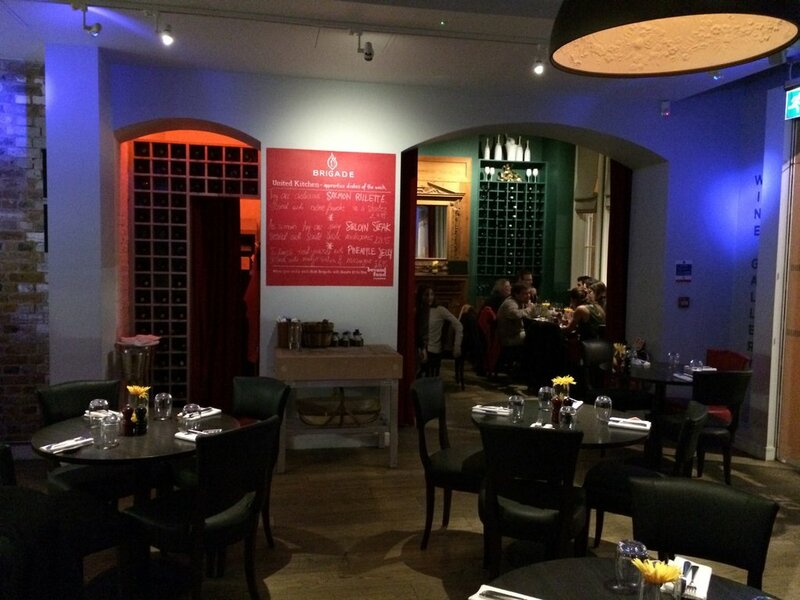 Brigade Bar and Bistro is situated in a historic old fire house built following the 1861 Tooley Street Fire. Brigade is not just a restaurant but is also a social enterprise that in partnership with the Beyond Food Foundation is offering catering apprenticeships to the vulnerable. Chef Simon Boyle has developed a system in which each apprentice is teamed up with a more experienced staff member and unlike on many work experience schemes, everyone gets paid. We have seem this kind of set – up before with Jamie Oliver’s Fifteen but it is a brave person that takes on such a project without the profile of a celebrity chef. Brigade is a much bigger operation than I was expecting. 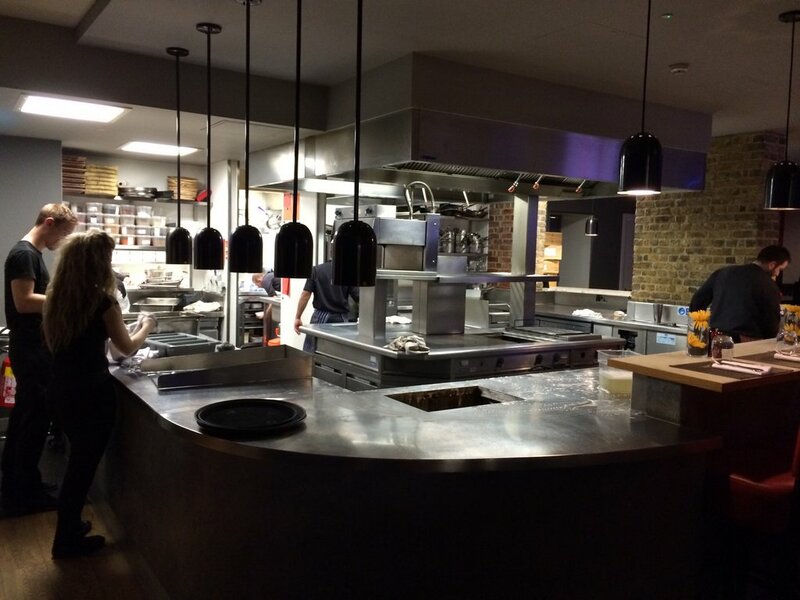 There is an upstairs that is utilised for private events and a cookery school and the downstairs is split between sizeable bar and restaurant areas bisected by an open kitchen. 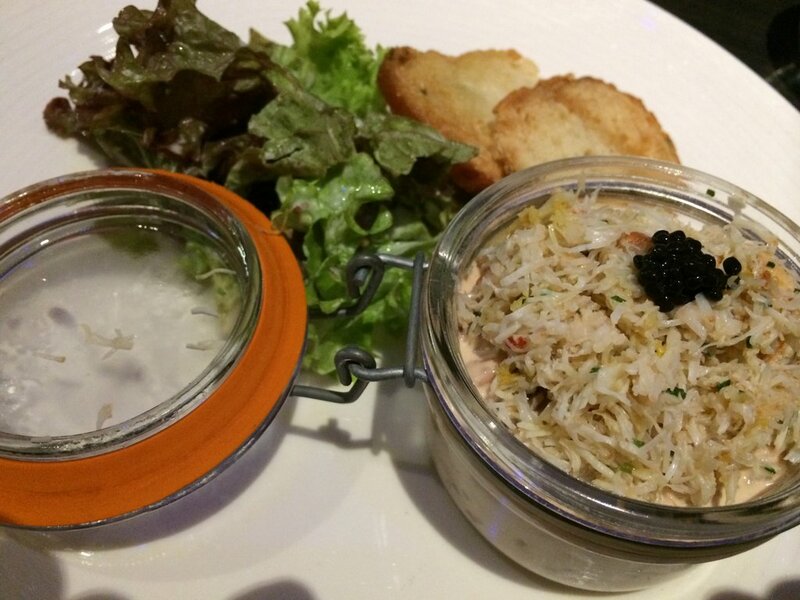 Both the restaurant and bar areas were buzzing, full of suits and suitettes happily drinking and chowing down. Worthy social enterprise intentions are one thing, but would the food deliver? 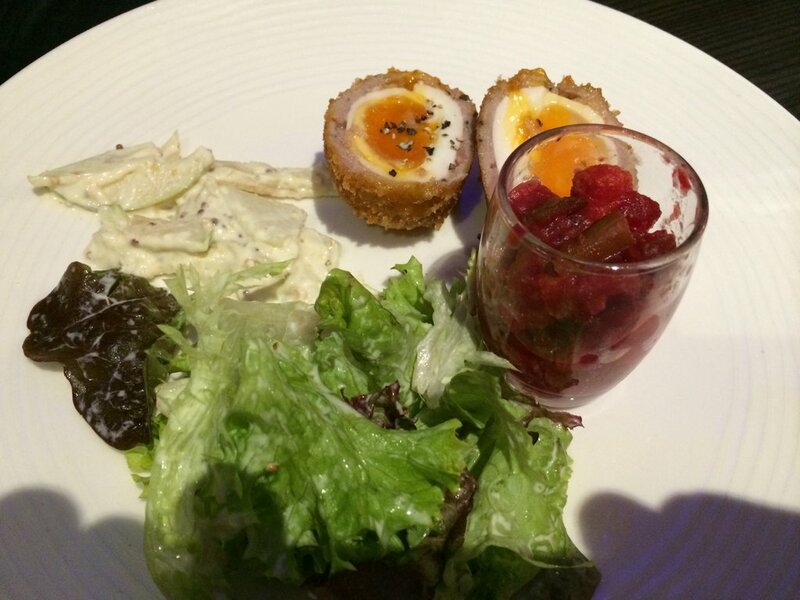 Scotch Eggs, beetroot piccalilli, fennel, green apple slaw (£8.95) arrived as a single egg rather than the plural offered by the menu, which might be an issue for the accountants from Ernst & Young around the corner, but the potted pork belly and breadcrumb casing was crisp and full of flavour and the egg just the right side of runny. South Coast Seafood Cocktail, topped with Cromer crab and a spiced Chase vodka sauce (£8.95) was a straightforward prawn cocktail with a piquant Marie-Rose sauce enlivened by the fresh crab meat on top-simple but really effective. We were drinking a bottle of La Cote Flamenc Picpoul de Pinet 2013 (£25), a medium-bodied Languedoc white with lime and floral notes that was a good match for my seafood starter and our mains. 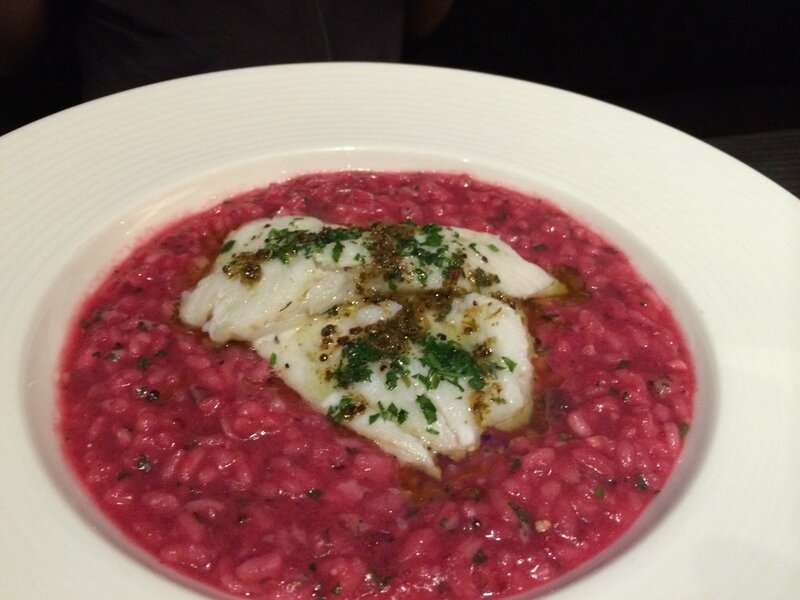 Steamed Pollock with beetroot and risotto (£15.95) was delicious. The fish was perfectly cooked, flaky and full of flavour and the risotto was crunchy and with the earthy beetroot tones turned into something more delicate. 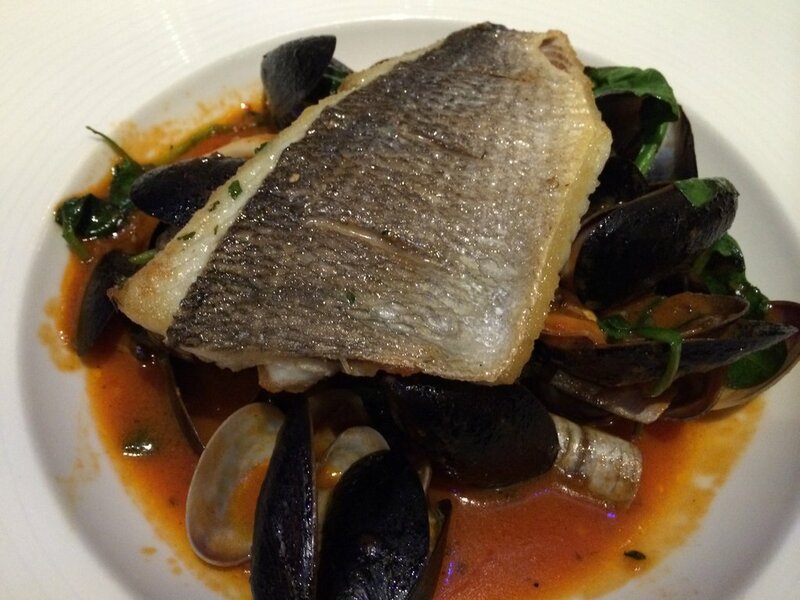 Seabass, mussel and razor clam tomato stew (£19.95) had Spanish notes of smoked paprika which gave the tomato sauce an attractive depth of flavour. It was slightly oversalted for me but still a good dish. Zesty greens with butter and garlic (£2.95) were crunchy and buttery with a garlic kick. 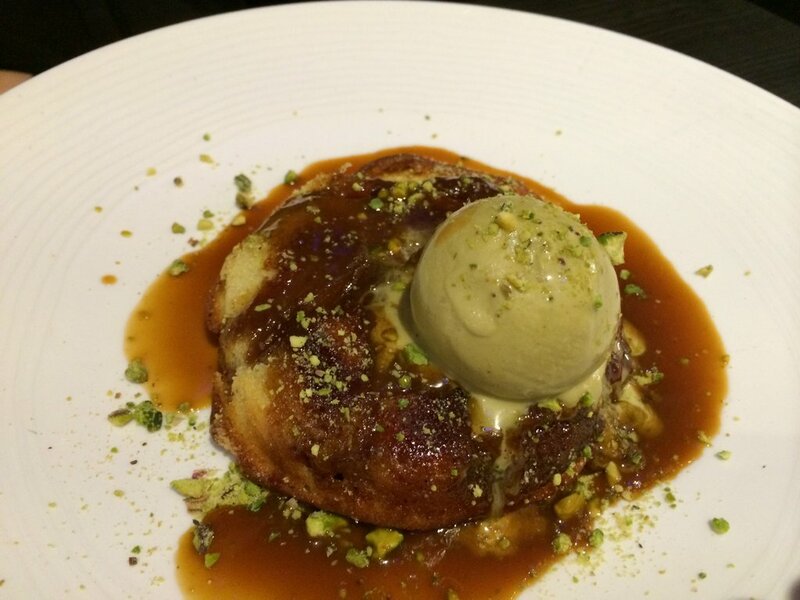 Spiced apple tart with pistachio ice cream (£6.95) was rich and gooey, offset by the cool elegance of the pistachio ice-cream. 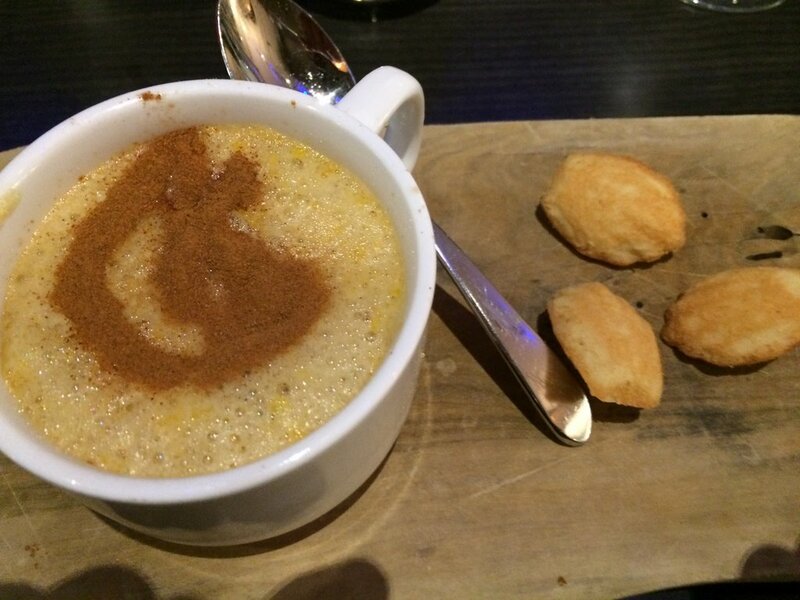 Cappuccino creme brûlée (£6.95) was a cup of frothy,eggy, caffeine-drenched sweetness and quite simply made me very happy. It’s a good thing that chef Simon Boyle is taking on apprentices but if the food at Brigade wasn’t delivering then it’s not a good enough reason to pay it a visit. The good news is that the restaurant is quite the model of a contemporary urban bistro serving starightforward food with a twist at a reasonable price point in convivial surroundings with the added bonus of feeling worthy at the same time!